I had the privilege of trying out the April Wild Inspiration Box, a subscription service for the outdoor adventure loving dude. I had somehow expected something for children, because, you know, that's what I tend to write about, but this is definitely more for the grown up audience. The box is shaped to fit through most letterboxes so for once I didn't have to drive 6 miles to my nearest post depot, and it's got a nifty way to open it (which I totally missed doh). So what's in it I'm sure you wonder by now, and it's a quite varied range of items. 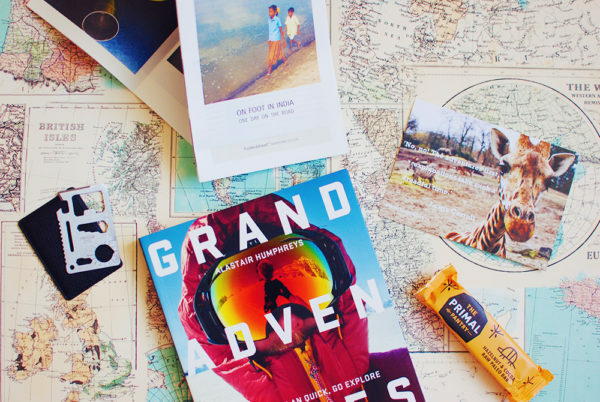 Most eye catching is Alastair Humphrey's book "Grand Adventures", which is beautifully designed and will keep the adventure lover busy reading for weeks. It's an inspiring book and really good read, also perfect for dipping in and out if that's your preferred way of reading. The energy bar from The Primal Pantry was really rather yummy, apparently it's all paleo not that I'm particularly fussed about the paleo craze, I do like my carbs a bit too much for that. All the more surprising that it tasted really good! The 9 year old confiscated the shiny multipurpose tool, a credit card sized item that is a new take on the swiss army knife (but much lighter!). To round things off , there's a lovely picture card with an inspirational quote, perfect for display on the fridge or similar for daily inspiration. I'd be keen to find out what future boxes will bring, so far it looks like a must have for the serious, north face of Ben Nevis climbing adventurer, as well as the stay at home and read a lot armchair adventurer. This month's box according to the Wild Inspiration Facebook page contains this: "This month we bring you Inge Wegge's latest movie Bear Island, a dry bag for your mobile and small valuables, handwarmers to keep your fingers toasted, a TREK bar to keep you going, a small bag off organic popcorn to enjoy while you watch the movie, an inspirational quote from Inge and our Newsletter. The film is available to download from our website and keep forever if you have subscribed to our boxes." We love our food and our family eating out. Maybe it's because I'm not a keen cook, but whatever the reason, the kids love eating out as much as we do. 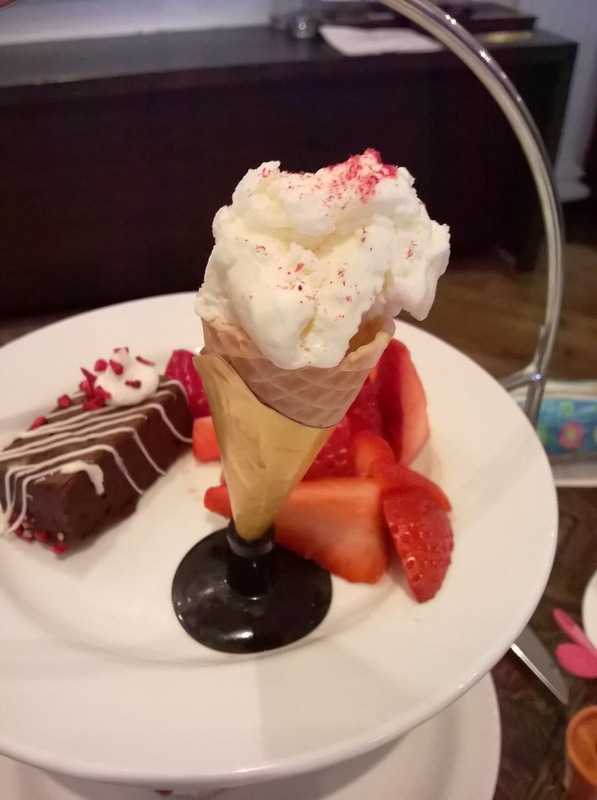 So it's little wonder that I couldn't resist the offer of trying out the Blythewood Square Hotel "Little Darlings' Afternoon Tea" when it was offered to review the experience. There's always a little apprehension around afternoon teas because of our combined dietary requirements - and it was refreshing and so reassuring that the staff was able to accommodate very personalised requests. The children's high tea even came with a menu to ensure that they could pick and choose and accommodate the general fussiness of childhood. But also the vegetarian and no cheese/mayonnaise diet was easily accommodated with the wide range of items, and the staff took every care that we had plenty of a varied choice of foods on our trays. The environment of the hotel is rather grand, and to be honest, we're not used to such grandeur. We were most definitely underdressed. However, the staff made us feel so very welcome and it was absolutely not an issue that my kids had arrived in their footwear of choice (wellies) or that mum turned up in her comfy ancient trousers and warm woollens. We were rewarded with great views and so much to look at in the restaurant that kept the kids well busy. Now to the important part, the taste test, because the proof is ultimately in the pudding. It was a festival for the taste buds, every single item (and there was quite a variety of items) had its very own character and was bursting of flavour. Needless to say that there wasn't much leftover. Afternoon Tea is available at the Blythewood Square Hotel Salon from 12 to 5pm and it's £28 for adults and £12.95 for children under 12. Hve a peek at the delicious menu. I asked the girls what I should write in my review and they said they absolutely loved it. Full disclosure: There was no bill in exchange for a review of the Little Darling's afternoon tea. All views are entirely mine.